I have been of fan of Mandisa for quite some time. I was first introduced to her music on the radio when I heard her song Good Morning. I just loved this upbeat song so had to purchase her Get Up CD which had a bunch of remixes that help me when I exercise. I really run faster when I have Mandisa on my iPod. So when I heard that Mandisa was releasing another album, I just had to check it out as it had another favorite Mandisa song on it Unfinished. 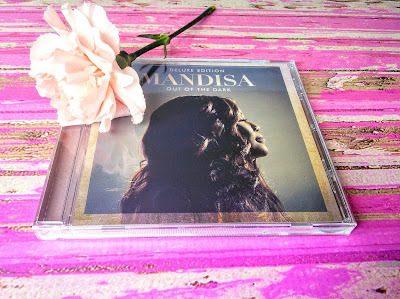 I really loved listening to Mandisa's voice on this her new OUT OF THE DARK CD. While this CD did not get me running faster, this music was great to listen to while I was getting some work done on my computer. This CD showed me a new side of Mandisa that was mellow yet refreshing as it lifted my spirits up. Mandisa wrote her song “Overcomer” in 2013 to encourage her close friend Kisha, who was battling breast cancer. Mandisa really believed and prayed that God was going to heal her, but when Kisha went to be with Jesus in 2014, Mandisa’s foundation was shaken in a way she never expected. She fell into a deep pit of depression for close to 3 years, shutting out her friends, family and the rest of the world. Mandisa believes if she had kept going down that road she was on, she would not be here today… but God stepped in and lifted her out of that pit by using her close friends to communicate their love for her and God’s love for her. This album is Mandisa’s way of letting her fans into her story – it’s called 'Out Of The Dark' because that is exactly where God lifted her out of! I have a copy of the MANDISA OUT OF THE DARK CD to giveaway to one of my readers. Just enter on the form below and good luck! I have never heard of her but would enjoy listening to her. I have never heard of her, but I am looking forward to checking out some of her music. Great article. I've never heard of her before, but I'm going to check out her music. I love Mandisa! I love her song Waiting for Tomorrow. I'm not familiar with all of her songs, but I saw a news show talking about a little girl that's very sick and she sand a Mandisa song that prompted Mandisa to visit her and do a show with proceeds going to help ill children. That made me like her right away. This is so exciting! I need a new CD with beautiful music for road trips. Just submitted my entry! This is so cool and good luck to whoever will win this giveaway! I bet the music would be lovely to listen to. Great giveaway! I haven't heard of her songs but I'm sure she's good. Good luck to those who enter this giveaway. I love her music, she has so much talent and sings from the heart!. This is an amazing givewaway as well. Anyone would be blessed to hear her music! I have never heard of this music, or her. She sounds beautiful and this is an amazing giveaway! I have never heard of her but always look forward to something new. Great giveaway. I love all of her songs, but I think Good Morning is my favorite too. It gets me in the right frame of mind to start my day. LOVE LOVE LOVE Mandisa! I have to get a copy of this CD. I LOVE Mandisa! She has such a beautiful voice and is very inspiring. My favorite song of hers is "Over Comer". I would love to win her latest CD! I love Mandisa!! She's amazing!! I need to check this album out! I have never heard of her before either but am checking her out now and she seems awesome. Thank you for sharing. What a lovely giveaway! Good luck to all those who enter. I would love to have a copy too. I hope I will win! Weee excited!!! I haven't heard of this artist before but I would like to hear her. I love giveaways and I hope that whoever wins enjoys this music! My favorite song by Mandisa would have to be Stronger. It's something that I love to listen to when I'm down or struggling. I haven't heard of Mandisa before, but am off to check her out now. Thanks for the giveaway! I have not heard of her but this sounds like a must try. I am also excited to learn of others musicians. I never heard of her, but my uncle loves checking out new music. I would love to give this to him.